Research by University of Ulster psychologists could help with the diagnosis and treatment of people suffering from Post Traumatic Stress Disorder (PTSD). 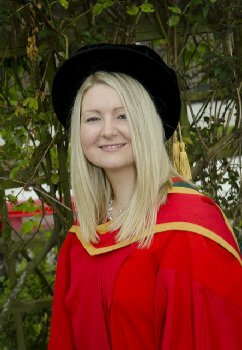 One of the researchers is Cherie Armour, was receives a PhD in Psychology at today's summer graduation ceremonies at Coleraine. Her doctorate research ‘Trauma, Posttraumatic Stress Disorder, and Psychosis: Addressing Contemporary Nosological, Phenomenological, and Etiological Issues’ focused on the classification of PTSD within the Diagnostic and Statistical Manual of Mental Disorders (DSM). Cherie, who is originally from Ayr in Scotland, already held a First Class Honours degree in Psychology from Ulster before embarking on her PhD research. While studying for her degree at Coleraine Cherie gave birth to her son Quinn, now aged 5 and during her doctoral studies, her daughter Kori, who is now 3, was born. Cherie’s PhD research was primarily concerned with the classification of PTSD within the Diagnostic and Statistical Manual of Mental Disorders (DSM). She explains that establishing the correct symptom groupings and the correct number of symptom groupings in relation to PTSD is important for a number of reasons. “Identifying the correct symptoms and symptom groupings improves assessment and diagnostic procedures because it has implications for diagnostic algorithms. This is important because a change in how symptoms are grouped together may impact on how many people do or do not receive a diagnosis, which in turn has implications for PTSD prevalence rates. She successfully balanced the demands of a busy home life with study to complete her PhD, in addition to teaching and collaborating on several research projects in the School of Psychology. To date Cherie has 21 publications at various stages of the review process (18 published and in press) and has built up an excellent network of international collaborators. Cherie hopes that her continued efforts in this area will inform the DSM-5 diagnostic criteria for PTSD which is due for publication in 2013. In 2009 Cherie was awarded the British Psychological Society’s ‘Postgraduate Study Visit Scheme’ bursary for an international visit to the University of Southern Denmark. As a result of her visit Cherie is currently employed as a postdoctoral researcher in the Danish National Centre of Psychotraumatology working for Professor Ask Elklit one of the leading researchers in the field of Psychotraumatology.